1000 VASES exhibition in Dubai presents a unique selection of vases in the Dubai Design District during the Art Dubai 2019 Festival. Sini Majuri has been invited to take part to the international show with her latest edition of the Jungle Collection. Sini Majuri’s glass vase collection Jungle was first introduced by DutZ Collection in 2018 and exhibited in design fairs around Europe, China and Japan. In 2019 there will be 3 new models premiered in Dubai. The theme in the new pieces is “Rainforest”. Eacn object is solid glass and shaped by hand. The technique used is Timo Sarpaneva’s Steam Stick. The event redefines both the space of the exhibition and the very presentation of an object, here the vase: a functional, everyday object that rises to the rank of fine-art object thanks to the work and imagination of these designers. This medium is therefore perfect to show all the plurality of the artistic scene today. 2019 edition of Jungle collection will be premiered in Dubai. The shape of the objects is inspired by Timo Sarpaneva’s Steam stick-technique. The public will be invited to discover, throughout the duration of the exhibition, the creations of young independent designers: unique pieces, made in a multitude of materials and reflecting the personality, the universe and the sensitivity of each. This overwhelming volume of vases compels us with its richness, its diversity and reveals to us all the artistic expertise of these creators. A profusion of vases which is nothing less than the reflection of the inventiveness and the creative intensity which they show, provoking in us this much desired emotion. To show the singularity of each designer while confronting him with what surrounds him to better understand the dynamism of the current creation, is at it’s core, the philosophy of the project 1000 Vases. Unknown Territories exhibition in Usagi Gallery shows 30 carefully selected limited edition pieces from 13 countries. The show proposes an exploration of places, stories and cultures hiding behind every design object. Uncovering the historical, cultural and social context of the exhibits makes us see them beyond their aesthetics. They become flesh and blood storytellers of the world they were born in. DP presents unique design pieces of leading edge designers from Europe, Asia, Middle East, South and North America transforming Usagi Gallery into a place where cultures, knowledge, and possibilities are exchanged. The Rain The Flying Boat-story by glass artist Sini Majuri is a cartoon made of glass and a story of transparent moments. Rain is a single scene from a the story that is immortalized inside blown glass. 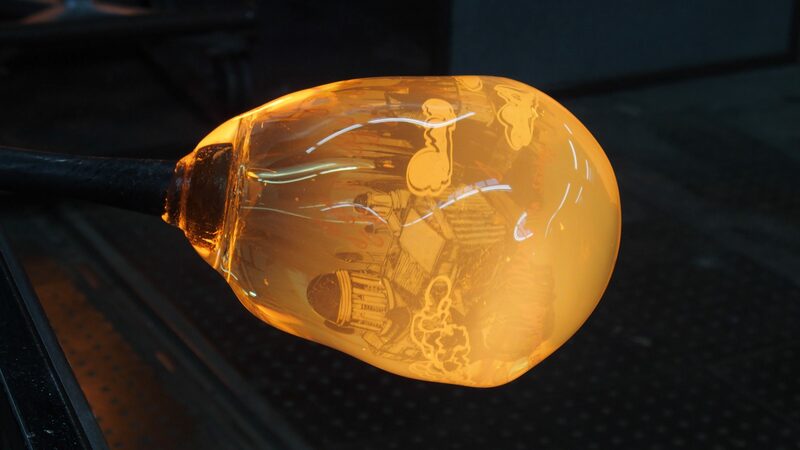 The stories are blown between layers of glass by using a century-old Swedish Graal technique. The layered images are created layer by layer during a slow process that takes months. Multiple image layers create surreal and dreamlike visuality in the works. The thick and heavy glass gives interesting optical properties to the dream scenes as the illustrations seem to move and distord as they are observed from different angles: Face of a woman looks sad when looked from above and angry when looked from behind. You can also see under and behind the image layers, there might be something hidden behind a window or deep into the woods in a thick forest. Rain is one of the main themes in this story about a woman that realizes that she is dreaming and don’t want to wake up. There are four individual image layers on top of each other inside every sculpture. It has been inspirational journey to design a line of luxury vases for Dutz Collection. The 9 object collection will tour European design fairs during 2018. 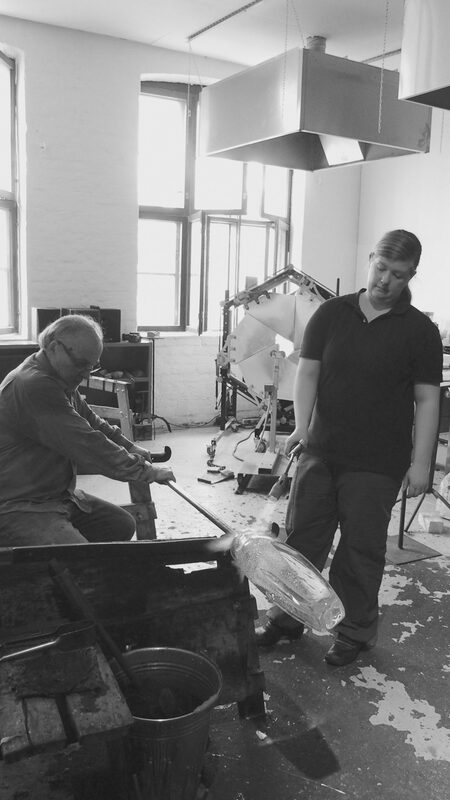 As a Finnish glass designer it is a great joy to see that a series of high quality studio glass is introduced in commercial setting with a strong message: quality is value. Here is a glimpse to the first prototypes made in Riihimäki. The collection is inspired by the nature. The premise of my glass design is to create objects that gain their value from the quality, design and material. My ambition has always been to create future classics. When I started to design the vase collection to Netherlands, I really wanted to capture the beauty of the glass material. I wanted the shapes to reflect serenity of the medium and to be weightless and strong at the same time. The core of the collection is to create pieces that have soul: The vases are mouth blown and shaped by hand, signed and numbered. Each piece has unique color play inside the glass. Sometimes a very simple object can became multi-dimensional, when you use glass medium. There is for example the visual layer of glass: how does the glass reflect, how will the colors look in different lighting. Above all there are also the historical layers of glass which comprice the origin of Finnish glass making and the rare knowledge behind the craftsmanship. It is interesting to contemplate the project from these perspectives and say once again: Quality is value! On ollut kiinnostava projekti suunnitella hollantilaiselle Dutz Collectionille korkealaatuinen mallisto sisustuslasia. Yhdeksänesineinen kokonaisuus lähtee kiertämään eurooppalaisia design-messuja vuonna 2018. Suomalaisena lasimuotoilijana on ilo nähdä, kuinka Riihimäellä käsityönä valmistettua lasia viedään suurina erinä rohkeasti kaupallisille areenoille näin viestien: Laatu on arvoa! Lasimuotoilussani lähtöajatuksena on aina ollut suunnitella esineitä, jotka kestävät aikaa: tulevaisuuden klassikoita. Harvinaislaatuisella käsityötaidolla veistetyt esineet viestivät alkuperän tärkeydestä, koska niissä käytetään puhtaita materiaaleja ja ne on suunniteltu ajatuksella materiaalin parhaita ominaisuuksia hyödyntäen, signeerattu ja numeroitu. Kokonaisuuden teemana on luonto ja sen tunnelmat. Olen saanut suunnitteluuni inspiraation kotiseutuni vanhoista puista ja metsien äänimaisemista. Dutz Collectionin mallistossa esineet ovat massiivista, jopa veistoksellista lasia. Ne ovat muodoltaan samalla vahvoja ja keveitä. Joskus hyvin yksinkertainen muoto voi olla moniulotteinen, kun käytetään lasimateriaalia, koska lasin visuaalisuus heijastaa, peilaa ja antaa mahdollisuuden läpinäkyvyydellä leikittelyyn. Suupuhallettua lasimallistoa voi tarkastella myös suomalaisen lasinvalmistuksen historiaa vasten todeten: Laatu on arvoa! It was a great experience to exhibit my first interior design objects in Tokyo. In many ways Japan is a logical place for Glass Mountains – because mountains have a special role in local culture. They can be seen even sacred. Therefore it was easy to explain the philosophy behind the design: that each object has a soul. The Interior Lifestyle Tokyo design fair 2017 was held in Tokyo Big Sight that is the largest international convention venue in Japan. My glass design was a part of the Nordic Lifestyle exhibition in Scandinavian Pavilion. The exhibition halls were beautiful and stylish. The show really was a good vantage point to Japanese design world. I noticed that most of the people spoke only Japanese so it was very important to have a expert interpreter. I was super lucky to have skilful Kanoko as my interpreter to help out! The workers attached the wall sticker on the wall. It was also very interesting to see how a large show like this was created in a fast and accurate tempo! The way the huge design fair was build up was quite spectacular to watch. First the halls were full of bubble wrap, hammers, power cords and ladders when thousands of exhibiters opened up their cargo boxes. But suddenly when the clock struck six every detail was precise, wall stickers and podiums on their accurate place and the design event was ready for the opening day. It was great to get the glass mountains in the front page of the fair guide. It was a big help for reaching out interesting partners during the event! I was happy to see, how people really understood the design philosophy behind the glass mountains: how each mountain is unique and has it’s own “soul”. I was so happy to meet the ambassador of Finland and his wife. They also gave some good and cool hints for the future! Vuoksi glasses are inspired by the melting ice. Each glass is unique like a snowflake. When looking back this project has been in many ways a dream come true and all the pieces just magically clicked together. I have always wanted find ways to bring my design to the mysterious Japan. I got a great opportunity to start working together with my family company that also made it possible to start manufacturing glass mountains as a serial interior design object. It was also great to see how the local countryside fund in Suonenjoki jumped in to support our design journey. Glass mountains from a small countryside city travelled a great distance to Tokyo to find cool new opportunities! Thank you so much to Mansikka ry and Maaseuturahasto for supporting our design adventure in Japan! Find more info from my new Facebook pages! VUORI glass mountains are sophisticated interior design objects for elegant and modern spaces. Each unique peak is handcrafted in Finland with high standards. Mountains can be used as decoration objects and custom interior installations. The 2017 series is inspired by the Scottish Highlands. Textures, colors and the athmosphere of the glass pieces resonate the unparalleled scenery of the Highlands. Glass mountains will be presented in ILT Interior Lifestyle Tokyo design fair in Nordic Lifestyle Pavillion in June 14 – 16. 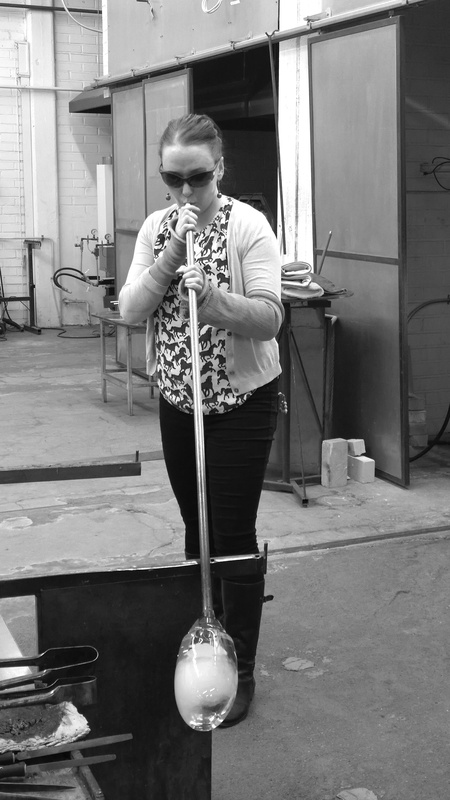 Come and visit the exhibition to find your own soulscape made from mouth blown glass!